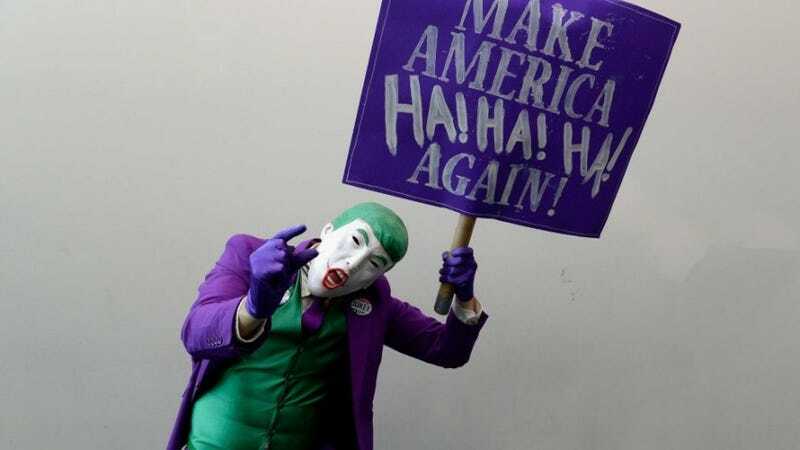 Mark Hamill has perfectly voiced one of the future president’s tweets as the Joker, and we could see more of them in the future. That might be one of the most beautiful sentences ever uttered—if it wasn’t also tragic. On December 31, Donald Trump tweeted out his New Year’s message to the public, basically sounding like a passive-aggressive Gretchen Wieners. He wants everyone to feel loved in 2017...even the stupid haters who can’t help feeling jealous, ya know? Like most of Trump’s rhetoric, it sounds stupid at first, but has an undercurrent of evil aggression—something Patton Oswalt’s brother, Matt Oswalt, pointed out online. Well, Matt Oswalt and the rest of America had their wish granted. With a little help from Audioboom, Hamill showed us exactly how Trump’s words sound like through a real villain’s voice. And you know what? It works. It sounds exactly like something the Joker would say. Of course, Trump’s tweets also sound exactly like something Futurama’s Zapp Brannigan would say, which is why Billy West voiced the exact same tweet as the arrogant space captain earlier this year. I’m sure there are plenty of other cartoonish baddies who could read Trump’s tweets as their own. Montgomery Burns, Dr. Claw, maybe Ursula the Sea Witch? Whether this means Trump should be viewed as a clownish buffoon, a sinister villain, or a combination of both, remains to be seen. All I know is I’m crossing my fingers that Hamill dubs the entire first State of the Union.